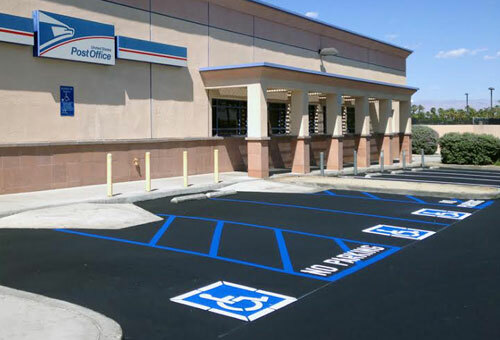 If you need help bringing your Orange County parking lots, crosswalks, and/or exterior walkways in compliance with the Americans with Disabilities Act (ADA), then rely on American Asphalt & Striping, Inc. We have decades of experience following ADA requirements on 1,000s of jobs; are familiar with the needs of business owners, property management companies, homeowners, and homeowners' associations (HOAs); and stay current with ongoing ADA revisions. Since we always send out highly experienced pavers for every job, you can rest assured that our inclines, ramps, walkways, and other site improvements will be installed in full compliance with all relevant building codes and property guidelines. At American Asphalt, we are skilled at providing a wide range of ADA-compliant signage, striping, and property improvements. This includes handicapped-accessible parking space signage, pedestrian crosswalk zones, concrete ramps, sloped handicapped entryways, landing pads, truncated domes, and tubular hand railings, and more. Our crews are among the best in the industry and can be trusted to precisely follow and implement your parking lot layout and design plans. Alternatively, they can provide upgrades or make recommendations to enhance safety, traffic flow, and/or space usage. Because we customize each of our projects to meet our client's needs and goals, we consistently achieve high levels of customer satisfaction. To set up a free, on-site consultation for your ADA signage and property improvements in Orange County, give us a call today. As a second-generation, family-owned and -operated business, American Asphalt prioritizes the best interests of our customers, and their guests, customers, and/or employees at all times. We complete projects within a pre-approved budget and timeline, and work closely with our clients to mitigate any miscommunications or site-specific issues. American Asphalt is a vendor that we have used for years. We have never had any problems, always on time and always on budget, always do what they say they are going . . .